... or you can create your own dedicated server at home on your Windows computer using this guide. UPDATE #5 This counts for Scorched Earth DLC and The Center as well.. just use TheCenter, ScorchedEarth_P instead of TheIsland in your launch params! UPDATE#4: Made sure that the AdminPassword Paramter was correct. Admin things are working on my end again! UPDATE#3: Updated the .bat Command Line and the Config. This is updated to Version 171.6 of the Game and Server. These things may not work on lower or higher versions! Added new information about joining a server a the Host! UPDATE#2: Added a troubleshooting guide, containing some minor ideas to help you when you run into problems. 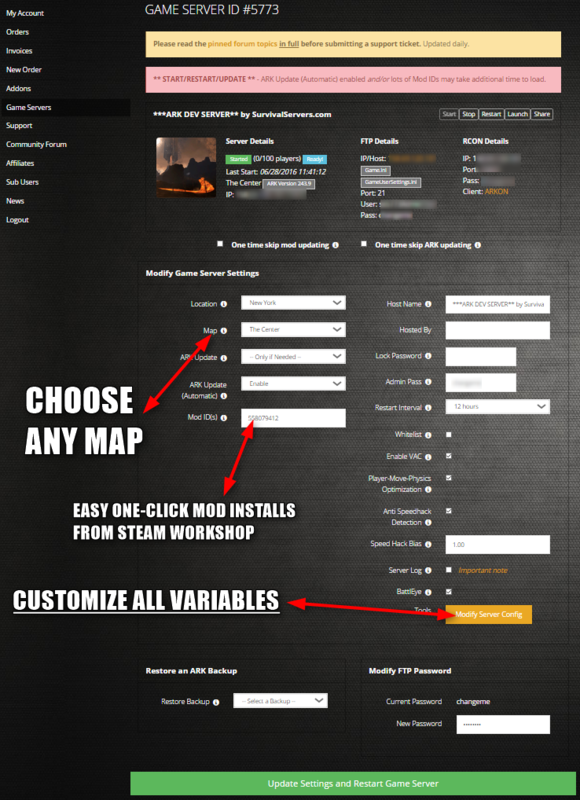 UPDATE#1: Added ServerCommand List from one of the Steam discussions and ServerConfig Settings, like "?ShowMapPlayerLocation=True" to the thread. Hey there, i'm making use of this fan created community forum and post my way to create my own local hosted (ON THE SAME COMPUTER!) server that everyone and i myself can join. Would have posted this on the Community Forums of Steam, but they bugged and i couldn't post it. you can just use the already available Server in the GameDirectory. Where can i find my "ShootGameServer.exe" file? The "steamapps" folder, should be in the Steam folder and location you have installed your Steam. Setting up the .bat file! So, we want to create a bat file to Start the ShooterGameServer.exe and put in some commands. You should create this in the Folder mentioned above! (In the same folder where the .exe is). Right click in the folder and create a new Text Document. Name it what you want. I named it "StartServer". > YOURSERVERNAME: This is the name of your Server in all lists etc. > YOURSERVERPASSWORD: This is the Password that you need to join the server. > YOURADMINPASSWORD: This is the Password a Player needs to type into the console to use cheat/admin commands. > MaxPlayers: This is the amount of Players that are allowed to connect to the Server. Make sure you also include the " at the beginning and end. Setting up the config file! I don't really know if this is overdoing it, but we will also put settings into the config file. and it is called "GameUserSettings". Make sure that the upper half isn't touched. This could be different on our PCs. Here again, change the CAPSLOCK parts the same way you did in the .bat file. The rest of the settings can be changed, but we will leave them for now! Make sure that you open the ports 27015 and 7777 on both your router and your Windows Firewall! This is important, but i can't really help here, since this depends on the router you are using. With this, the Server is running. It will take a few MINUTES for it to be fully registered with the ARK master server to show up in the Server Lists. Open up your main Steam window and open the upper left tab called "View". There should be a point called "Server" which opens the good old server browser from Steam. Go to "LAN" and select ARK as a Game in the lower left filter. Refresh the List until you see your Server, this can take some time. And yes, you are seeing your own Server as a LAN Server. We will get to this in a sec. As soon as you see the Server, you know it is up and running! In the upper right search field, search for your Server, either by the Name you took for it or by using your IP (not the local one, use "whatismyip.com" to find out what your IP is). At least THERE you should find it. Otherwise there is something fishy with the Ports i guess. If you found it, click on it and send your friends the link to your Server. Tell them to close the Game and click on the IP. Clicking on the IP will let them Connect to the Server. This is how my friend joined my Server and it worked. It could also work through the normal UNOFFICIAL Server List or the Steam Internet Server List, but this is how it worked for us. Once the Server shows up in LAN, start your game. Move to the ServerList and search for "UNOFFICIAL" Servers and make sure you hit the "Password Protected Server" thingy. Let the Search finish and make sure that you CAN'T SEE the server in this list. Then change the search filter from "UNOFFICIAL" to "MY SURVIVORS". Waiting a few seconds and you should see your own server. Admin Commands and additional Server Settings! You can find a list of admin commands (that you can type in through the console) and Server Settings here. and the config file seems to work. Sadly not the Crosshair. No space between this and the Password (the ? is important), but a space between the rest "-nosteamclient....". How to update my SteamCMD Server after ARK was updated? Go ahead and launch SteamCMD again. Login again like you did the time you installed the Server. Which will update the Server App. I can't find my own Server in the List? First of all, which list? If you can't find it in the LAN list, make sure that you at least waited 5 minutes. Could even take more time. The Server needs time to register with the Master Server from ARK. If it is still not visible, check the Settings and .bat file again. Maybe you misstyped something. Also make sure that your Ports are forwarded! If you can't find it in the UNOFFICIAL list inside of the game, this is normal. You won't find it yourself. won't find the Server. This is a work around for Server Hosts, because they can't find their own Server without. the Server should show up. If not, please check the whole tutorial and make sure that everything is running to this point. If everything seems correct, but the Server is not showing up, i guess you still have problems with your Ports. Check if others can find and join your server (the normal way. They don't need the workaround). This is how it works for me. I hope it will do the same for you. I can't really give your support here, since i'm not a developer of this game. Please be nice to each other and the Devs, and let us enjoy this awesome game! Last edited by eXi on Tue Jun 30, 2015 3:39 am, edited 8 times in total. You need to place the .bat file in the folder where the ShooterGameServer.exe is. It must be in the exact same folder. I kinda hope you can help me because I can not get the server up and running. I followed your guide and thought I did everything correct, but when I to the server list and try to find my server, it will not show up..
Eminem1 wrote: I kinda hope you can help me because I can not get the server up and running. I followed your guide and thought I did everything correct, but when I to the server list and try to find my server, it will not show up.. If the server doesn't appear here, and you have the exact same search filter, then the problem is either a wrong config/bat file, or not correctly forwarded ports. You need to wait a few minutes till it is online! Don't expect the server to be visible directly after starting it. It could end up taking max 10 minutes. If you can find the Server in LAN, tell me and i will try to work you through the rest. Hey It's me Kalas from the Server Hosting ARM Steam Forum. Its the Serverlist on steam im talking about. I got a feeling I maybe did something wrong when I tried to open the ports..
As i told you on the Steam Discussion already: I have no idea how to help you with Windows Servers. I guess you miss some DirectX files. Try install all DirectX packages.